The north of Chile is the astronomer's paradise, and hosts many of the largest aperture telescopes looking at the southern skies (the northern sky is best seen from Hawaii or the US southwest). There are two main reasons for this: dry high mountains and political stability. 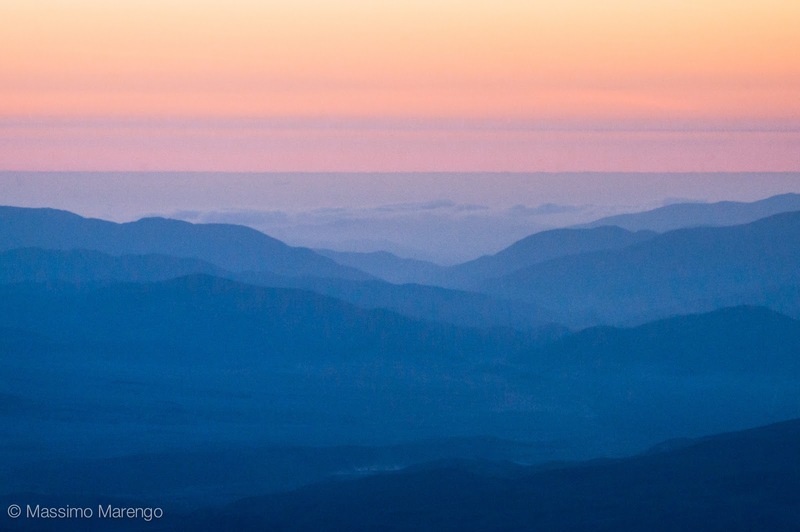 The high plateau in northern Chile are shielded by the Andes from the easterly moist winds: raising above the inversion layer in the atmosphere, the Andes stops the Clouds on their east side, leaving deserts to the west and forests (the Amazon) and grasslands (the pampa) to the east. Lacks of clouds means transparent nights and a sky with little turbulence, in turn guaranteeing excellent observing conditions for most of the year. Political stability means the possibility of building long-term expensive projects, and the creation of the necessary infrastructures. The dirty secret of astronomy is that Chile was chosen not because it was the best absolute place in the Andes, but because Pinochet's dictatorship was guaranteeing long-term commitment in exchange for investor countries to overlook the human right violations in the country. In the end, modern democratic Chile got a good deal out of the observatories (Chile is now the world's country with more guaranteed telescope time in the world, and an astronomer's mecca), but at the time I suspect there was a lot of looking the other way from the community. I have been in Chile several times, visiting the Las Campanas Observatory (LCO). LCO is in the "Norte Chico", which is a region one hour (by small plane) north of Santiago, but not as north to be on the border with Peru (the "Norte Grande"). The closest city is La Serena, a nice town on the coast, renowned vacation place thanks to its long sandy beaches. Two other observatories are in the area: the observatory of Cerro Tololo (managed by the NOAO, the organization providing open access time to US-based astronomers) and the La Silla Observatory (managed by ESO, the European Southern Observatory). LCO is instead a partnership of the Carnegie Observatories with the Smithsonian Astrophysical Observatory (SAO): my ticket to the telescope was through SAO, where I had been employed for many years. I will post photos of the LCO telescopes at some other time, but you can see the telescope domes of La Silla in the panoramic below: can you find the white dots on the crest of the mountain on the left? The photo was taken from the minibus driving me from La Serena to Las Campanas. The large photo above and the small one on the left show the sunset from the LCO terrace, shot the first night I arrived at the site. As you can see the area is very isolated, with just a few little villages in the valleys below, guaranteeing no light pollution that would blind the delicate astronomical instruments. This is actually a serious issue for modern astronomy: the main sites in Arizona, for example, are in a constant struggle to keep down light pollution from the Tucson metropolitan area, which are bright enough to seriously degrade the site. 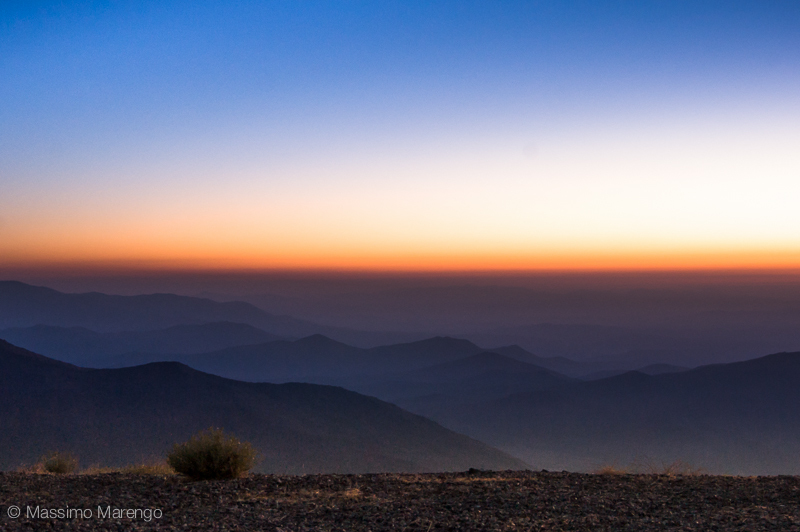 To prevent this issue, the Chilean government has recently established a vast protected area around the observatory sites in the Atacama desert (this is in the Norte Grande), to favor the construction of the new 30 meters telescope (the European Extremely Large Telescope, or E-ELT) that Europe is building there.